SHARMINI PERIES, EXEC. PRODUCER, TRNN: This is The Real News Network. I’m Sharmini Peries, coming to you from Baltimore. And welcome to this edition of the Glen Ford report. Jeffrey Williams, just 20 years old, was charged on Sunday for the alleged shooting of two police officers working at the demonstrations that took place in front of Ferguson Police Department shortly after the resignation of police chief Thomas Jackson on March 11. The young man, Jeffrey Williams, thus far appears to be unknown to the organizers of the demonstration, who’ve been fighting for civil rights and justice since the killing of Michael Brown. How the media has covered in these events is the topic of our next discussion with Glen Ford. Glen is the cofounder and executive editor of Black Agenda Report. Thank you so much for joining us, Glen. GLEN FORD, EXEC. EDITOR, BLACK AGENDA REPORT: Thanks for the opportunity. PERIES: So, Glen, you seem to take note of the way that the mainstream media has been covering the shooting of the two police officers, and you seem to contest that point of view. FORD: Well, yeah. The New York Times and the rest of the corporate media, CNN at the rest, they are saying straight out that the shooting of these two cops is somehow a setback for the Black Lives Matter movement. Well, whether it’s a setback or not really depends on what you think the goal of the movement is. And to find that out, you need to talk to the people who are running this movement, not to CNN and The New York Times or any of the so-called black leaders that they decide to talk to. So if the goal of the movement is to establish better relations with the Ferguson Police–and I mean the Ferguson Police as they are presently constituted–then shooting at Ferguson police certainly is a setback to the movement, because you don’t start a dialog with gunfire, although the police express themselves through use of force all the time. Lots of people are talking about dismantling the Ferguson police force entirely. In fact, Attorney General Eric Holder is entertaining that idea. And if that happened, then the county police force would take over the policing duties of the Ferguson police force. So if the goal of the movement is to create better relationships with the county police force, which would be taking the place of the Ferguson police, then I suppose that the shooting is a setback to the movement. And, finally, if the goal of the movement is to set the stage to make Eric Holder and his Justice Department’s job easier as they pursue a consent decree and then bring forward their usual reforms, if that’s the goal of the movement, be helpful to Eric Holder, then I guess the police shootings are a setback to that movement. But I don’t think that this Black Lives Matter movement is about helping the U.S. Justice Department perform consent decrees. I don’t think that thousands and thousands of young people have gotten all fired up about establishing cozier and more loving relationships with the police. This movement is not about making the armed occupation of black communities all across this country more pleasant. The movement is about ending that armed occupation. It’s not about reconciling black people to the armed occupation, and it’s not about making cops feel better about being the armed occupiers. The movement’s not concerned about cops being happy or feeling safe and secure; it’s concerned about black people in their own communities feeling safe and secure and not being afraid of the police. And there’s no reciprocity involved here. It doesn’t go both ways. The police are supposed to be in service of the people. There’s not supposed to be negotiations between the police and the people. 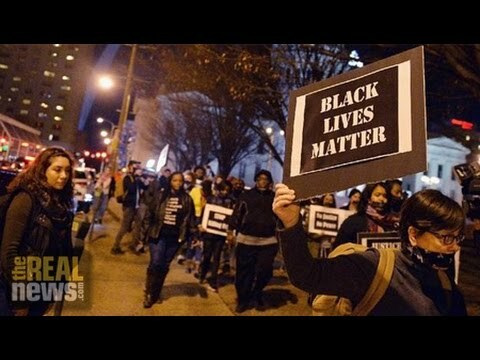 The goal of the movement–and I think this is the truth; I think this is what the organizers are really looking for–the goal is to establish black community control over the police and to change the meaning and the practice of policing in the United States. Therefore there’s been no setback to this movement by this individual shooting at cops, just as there was no setback to the movement in New York after two cops were shot dead back in December. In New York, the demonstrations continue, and in Ferguson they continue. PERIES: Now, Glen, one of the things, positive things coming out of the Eric Holder report is he actually stated in his report that this police force in Ferguson cannot be reformed. It must be abolished. So the next step for the movement is really revising how they govern the city of Ferguson in terms of policing. So the question to you: is policing necessary? And in what form should that be reestablished? FORD: Well, policing as it exists in black America is not necessary. It is part of the oppression of black America. There is an assumption that black people are criminals. Ever since around 1970 that has been the process, that has been the driving force behind policing in the United States, the assumption that black people are criminals. And if that is what underlies the Justice Department’s philosophy of policing, then whatever they do with their consent decree is going to reflect that same oppressive kind of ideology. If we’re talking about how black folks organize in Ferguson to try to create a different kind of police department, well, you do that on several fronts. One, of course, is just in the electoral arena. And folks are getting more active in Ferguson in that arena. But the other, more important piece is in the streets. We know the name Ferguson. We have a movement that’s associated with the little town of 30,000 called Ferguson because black people stood up to the police. And that standup battle is by no means through. It’s just begun. And it is the behavior of folks in the street, what they will tolerate from whatever police force they put in Ferguson. Whether it’s the county police or reconstituted Ferguson Police Department, it’s the people’s behavior in the face of what we can expect to be the same old kind of policing that would be important to the continuity of this movement. PERIES: Glen, as always, I thank you for your commentary. We appreciate it here.